Suppose that there is an alien spacecraft travelling towards the Sun. This spacecraft is similar in design, size and power output to Voyager 1 and Voyager 2 as they were immediately after launch from Earth, and is coasting in its orbit (no powered maneuvers taking place). Also suppose that a budding scientist on present day Earth just so happens to point their instruments (optical telescope, radio telescope, or something else; ground-based or space-based) in exactly the right direction at exactly the right time. If the spacecraft is communicating at all at this point, it seems unlikely to be transmitting in the direction of Earth. How far from the Sun (or Earth) could the spacecraft be where we'd still have a chance of detecting it, assuming for a moment that all events line up perfectly for detection? Would we be able to determine that it is likely an extraterrestrial spacecraft, as opposed to some natural interstellar object? $\phi_0 =1.22 $$\lambda \over D$, where D is the diameter of the optics. $R = 40\times10^6 \ m$, or 40 thousand km. This distance is about the height of the geosynchronous orbit. If we instead are using passive radioastronomy, we have the largest structure on Earth to have a diameter of 500 meter (Chinese FAST) operating at a wavelength of 0.10 meters. This would give a minimum detection distance of about 11000 meters. But I guess in this case we would first see the optical trail of the satellite burning in the atmosphere. Optics are a bad choice, so maybe thing about the radars used in tracking space debris, which have incredible resolution. Of course, that will be reduced the farther out you are looking. Detection of a 2cm object at 1000km is not out of the question, so detecting something 12' large (if you just want to see it, not gain any surface information) would roughly be 180,000 km. By using an active transmission component, it can double the detection range. So around 400,000 km isn't out of the question with current equipment (optimized for a different purpose). It wouldn't be out of the question to use more power, more or larger receivers, different frequencies etc. to increase this range by a considerable amount. You eliminate the largest factor by allowing the 'lucky spotting' scenario. With this in mind, I see very little reason why detecting something at the edge of the solar system with a purpose built system is out of the question. As for knowing if it is alien or not, I doubt this is all too feasible without receiving transmission from it. You would know its path, speed, and approximate size. Other than that, you'd have to wait for optics and the object to be much closer. Instead of using reflected optical wave light from the sun, lets try to detect something that the probe itself is emitting. 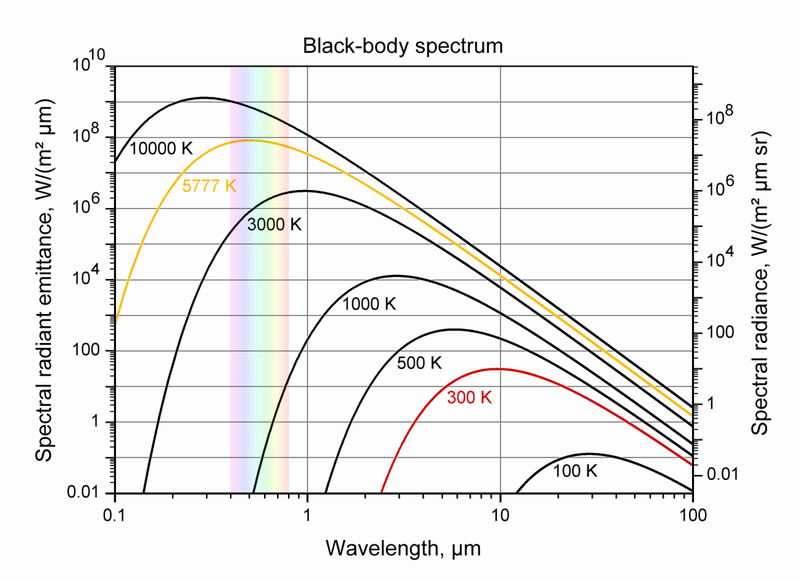 Any radio emissions are very unlikely to be targeted at Earth, so the most likely emission that we would capture would be black body radiation from the probe itself. One possible alternate calculation of detection is to simply use the optical resolution equation that L.Dutch used, except substituting in a wavelength of 10,000 nm for 500 nm. This makes the detection range 800,000 km: greater than the distance to the moon. I tried to calculate difference between Voyager's IR emissions and background IR, but couldn't get enough data; not on background spectra, Voyager's surface area or in many other areas. I did note that cosmic IR background peaks in the 100-1000 $\mu$m range, significantly higher than the peak for Voyager. This suggest that we might be able to get good resolution at the lower wavelengths where Voyager's IR emissions will be maximized. Not the answer you're looking for? Browse other questions tagged space spaceships hard-science or ask your own question. How large does a spacecraft need to be to be visible from the surface of the Earth at 400 km altitude? Could Jupiter moon Europa become habitable when the sun enters its red giant stage? How many spaceships would it take to block the Sun from the daylight side of the Earth? How far could a planet be from its star and still be kept habitable by intense greenhouse gases? How could humanity live on the Sun?